The road was dusty that morning which is the normal state of all mountain-side roads in the islands of Greece. The sun was shining at its peak and as we skirted through yet another sharp bend on the road, its rays blinded me. It must be hard to drive through these winding roads, I thought. Good thing I wasn’t the one driving. 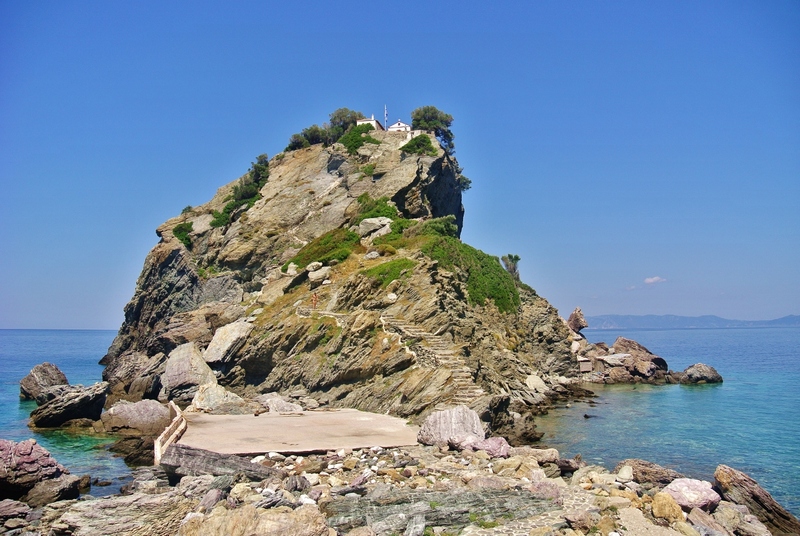 Our mission for our third day in Skopelos was only one thing – to visit Agios Ioannis Sto Kastro, climb up it and relive the Mamma Mia movie scenes shot there. It was quite a drive from where our hotel was but The Greek Mister doesn’t mind, as he knows I’d nag if we didn’t go there. All the way there, I was crossing my fingers that it’s going to be a great place so that he won’t be disappointed and wouldn’t think that it was just a waste of time. Thankfully, Agios Ioannis is worth it all. I saw a glimpse of the rock mountain with the church on top of it as we drove through another bend. Look! There it is!, I told the Greek Mister in my high-pitched voice due to the excitement that I was feeling at the mere sight of it. The church looked so tiny from where we were, it made me all the more curious to see how massive the rock mountain where it’s perched is to make it look that tiny. As we passed through the last bend of the winding road, the colossal rock mountain stood before us in all its glory. I got out of the car before we even found a parking space as I couldn’t stay inside it any longer and would love to admire the exquisite beauty standing right before me immediately. I stood in front of it in silence, I was stunned, in speechless admiration. I had to stop myself from taking photos and just be there, in that moment to take it all in. As I gazed through it, up to the top where the church of Agios Ioannis was standing – I only had two questions in my mind.Why? and How? Why would you build a church on top of this monstrous size of rock mountain? Do people really go to that church up there every Sunday to hear mass? And how were they able to build it? Did they haul up all the materials on foot? Did someone die while it was being built? Slipped a step maybe? I read somewhere that people get married there and have their party as well at the grounds of the church. How can you have a party on top of a mountain rock without thinking of the safety of your guests who probably are going to have already had a drink on their way down from it? You must be a special kind of adrenaline junkie to have your wedding there or even attend a wedding there. I walked towards it and noticed a trail of steps carved right at the side of the mountain itself without any sort of railing to stop you from falling through the huge rocks below. It made my fear of heights take over my whole being. It’s that feeling of self-preservation tactic your body switches to when it feels like you’re in danger. My mind’s telling me not to climb those steps, my knees’ trembling just by the sight of it and I can hear my heart beating like my heart suddenly shifted its location and settled just right beside my eardrums and I can also feel its beating near my throat. I suddenly had that feeling of nausea. I’m a bit cuckoo like that but if it means that I have to get over this fear to be able to do what tourists do in Agios Ioannis, then I’d do it. The Greek Mister and his friend decided to wait for me at the taverna nearby as I do the climb so it was just me and my courage. I figured that if I will continue on analyzing how I’d get over my fear of heights as I climb through this mountain, I’d probably change my mind. The only way for me to be able to do it is to actually do it. With herculian efforts that only I can manage, I took the first step and continued on upto the first viewpoint of the mountain. The view from there was absolutely stunning! From there, you can see the spine of mountains that runs along the island’s length. The crash of the waves against the big rocks down below you is mesmerizing to see and hear. On the other side is the calmer part of the sea where a beach is supposedly located but from this point, I still couldn’t see it. After catching my breathe, admiring the scenery and taking photos – I decided to start the second and last half of the climb. The stairs in this part of the climb had railings – but it has railings for a reason, it’s much steeper and the stairs are narrower not to mention scarier as well. My heart was pounding harder and I can hear a voice in my head telling me to turn around and get back down. But the better side of me reasoned out that I have made it to that point, might as well just do it all the way. I don’t want to leave Skopelos and have that thought of I should’ve done it. So I did. Holding the railings so hard like it was the only reason I was alive was how I was able to get to the top. Also, not looking down was another tactic that I practiced. I was just looking on each step, treading it carefully and making sure that my foot doesn’t miss one. I was out of breathe when I reached the top for two reasons – the climb was steep and my heart was pounding like crazy due to my fear of heights which I have successfully overcame. And my reward is the sweeping views of the Aegean Sea on both sides. It was all worth it. The church wasn’t that fancy, in fact – if someone’s expecting the church to be anything special they will be disappointed. But it’s the view, the atmosphere and the calming ambiance of being at the top and seeing the beauty of nature right in front of you which is rewarding. I stayed up there for a couple of minutes and when a family with little kids came, I decided it was time to go back down. Specially when the kids starting running around ruining the calm and peaceful ambiance of the place. Lol. As I got out of the tiny gate and looked down at the same steps that I went up to to get there, I can’t help myself but say “Holy crap!” It was steep and there’s no way my tactic of not looking down will work because I had to look down and see the height that I am in from my peripheral vision. I was panicking! I was sure that time that I won’t be able to get down at all. But there’s no solution for this but just to get my act together and hope for the best. It took me awhile to muster enough courage to start my way down. But as you may know since I’m writing this entry, I successfully and safely made it back. It took me a longer time to get down – I stopped a few times and just sat on the steps with my back turned from the view so I won’t be able to see how high I was in. I had to stop because I was THISCLOSE to screaming and crying. Thankfully, it was a very uneventful climb down apart from the stops I made which I think was necessary. As I walked towards the taverna where The Greek Mister was waiting for me with his friend, they had silly grins on their faces like they had a better time than me sipping their beer with the mountain as their view. I on the other hand, had a knowing smile on my face as I was aware that what I’ve seen, conquered and done that day will forever be etched in my memory. Yes, I overcame my fear of heights at Agios Ioannis in Skopelos. Yes! The view is worth it all. Look like Greeks had a fascination for building in high, difficult places to reach. I went once to Meteora (have you been?) and it mind boggling how they build so many monasteries on the top of rocks. Anyway, at least, they left us interesting places to visit (with nice views!). Thanks for sharing. Looks like it was totally worth the trip and the effort to tackle your fear of heights! The scenery is breathtakingly beautiful! I’ve always been afraid of heights, but I’ve challenged myself in the last few years. Just you, I would of climbed to the top just to take pictures and admire the views from the top which looked incredible. Glad to see you overcame your fears.